I've never had a job where when I go on vacation, I get overwhelmed with wanting to return to work, until now. I was gone for three weeks in Hawaii and all I wanted to do was crochet. But I had to stop myself from buying yarn because I had just stocked up on all the colors I needed to complete my orders, so I would just be wasting money. Plus, I only brought one little carry-on bag with me, so there was a very limited amount of room (clothes is important!). 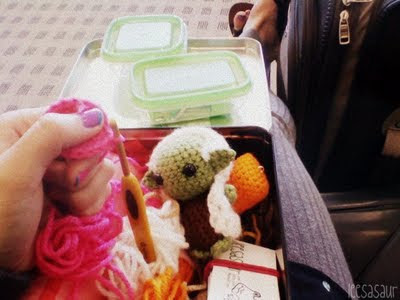 However, I did bring my workstation-on-the-go and already started at the airport on a requested pink penguin keychain with music notes on it for my little sister. I also managed to finish six French Toasts and two Creamsicle Chill Pops, so despite not being able to finish online orders, I was somewhat productive. Yet, now that I'm in the sweatshop, I kindof want to go back on vacation! Surprisingly I pulled a lot of orders while I was gone, which doesn't quite offset the amount of money I dispensed this break, but it does let me know I am headed in a terrific direction. 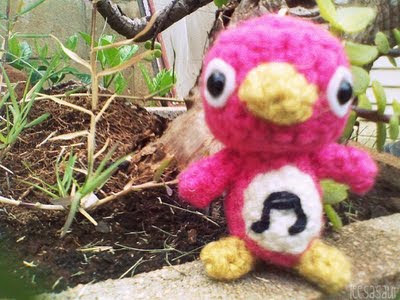 Anywayz,,, cute pink penguin! I also see that you use the nice crochet hooks with handles. I've got the aluminum crochet hooks. Do you find that the hooks with the thick handles are easier on your hands? Exactly! And thanks! Yes, I probably only made one or two things with the aluminum hook when I first started, but then I tried out the flat wide ones and they are so much better. Try one out! That pink penguin is very cute!